Fourth annual JAF golf tournament raises a record-breaking $180,000-plus! 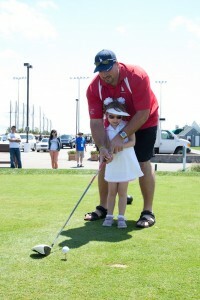 We’re all still recovering from the Joe Andruzzi and Friends Golf Tournament, counting our donations and blessings. So far, we know we’ve raised at least $180,000! It’s a significant increase over last year’s total, and we’re immensely grateful for all the love and support we continue to receive from our friends, family and donors. Our golf tournament is one of two major events – along with our fall gala – that sustain our Foundation’s work with cancer patients and families all year long, so we were thrilled to surpass our goal. Every year, Jen and I aim to help more families pay pressing bills during cancer treatments. And we want to continue our support for innovative pediatric brain cancer research at Children’s Hospital. These funds will allow us to grow and do more. The tournament was a total blast. It was a beautiful, sunny day at Granite Links Golf Club in Quincy, and I’d like to thank everyone at the course that helped make the day so great. Everyone came ready to play… though some, admittedly, not very well! Event co-host Rob Gronkowski characterized himself as a “hacker” and Kevin Faulk described his game as “very horrible,” despite his shiny new golf clubs. I myself am definitely no golf pro. I think it must be kind of funny for the media and fans to hear all these professional athletes admit they’re not good at the game. It definitely lends a casual and humorous tone to an event that supports a serious cause, which is nice too. You have to be able to laugh at yourself! We had an awesome turnout of Patriots players and coaches, including event co-host Rob Ninkovich, Dan Koppen, Nate Solder, Logan Mankins and Marcus Cannon—a fellow non-Hodgkin Lymphoma survivor! Old friends joining me on the Pats alumni roster included Tedy Bruschi, Harold Shaw and Ronny Lippett. Hardy, of 98.5 The Sports Hub, graciously served as our event emcee and comedian Lenny Clark was also on-hand, contributing his usual cracks. After golf, our party adjourned to the clubhouse for activities we’re better at: eating, laughing and raising money for a good cause. Gronk in particular was really excited about the free food! Our auction was action-packed, with lots of folks vying for our top packages: Patriots, Red Sox, Bruins and Bruce Springsteen tickets, and a four-course Italian feast served by Salvatore’s Restaurant Chef Victor Paone. We were also honored to hear grant recipient Glen Jusczyk share his daughter Malia’s cancer story. With another fun and successful tournament behind us, Jen and I once again offer a heartfelt, humble thank you to all of the people who make our work possible: Patriots players and leadership, the Boston sports community and the immensely supportive network of friends who have truly become our New England family. We also can’t say enough good things about all of our corporate partners: presenting sponsor Credit Union Kids at Heart, Millennium, East Commerce Solutions and Team Impact, The Home Depot, Salvatore’s Restaurant, Bob’s Discount Furniture, Hobbs Brook Management, LLC and I.B.E.W. 104, CBS Radio Boston, Majestic Construction, Inc., Quality Beverage, Inc., Powerade and Grey Goose. It’s a long list of thank yous, but that’s a great problem to have! And be on the lookout over the next few weeks for some video highlights of the tournament, like this message from Gronk and Bruschi! We hope to see everyone again at our gala in fall and – of course – on the links next year. Maybe we can all get a little more practice in between now and then, and come out swinging!